I keep hens because they lay lovely eggs. I love that I have beautiful yellow yolked eggs whenever I want them, I never need to worry about the condition of the hens producing them, because I can look out the window and say with some confidence that they are the happiest most well looked after (spoilt) chickens that there has ever been. When, a few weeks ago, it became apparent that I was not going to convince one of our girls that being broodie was not required of her, I gave in and let her keep a little clutch of eggs. Last year she managed to hatch out some grey partridges so I had no doubt she would do another fantastic job this year. And she has. Six little chickes, who I presume are silkie crosses, with perhaps some pekin and dutch bantum thrown in. Either way they are very sweet chicks and are currently scratching around the garden at three days old looking for worms with their mummy hen. 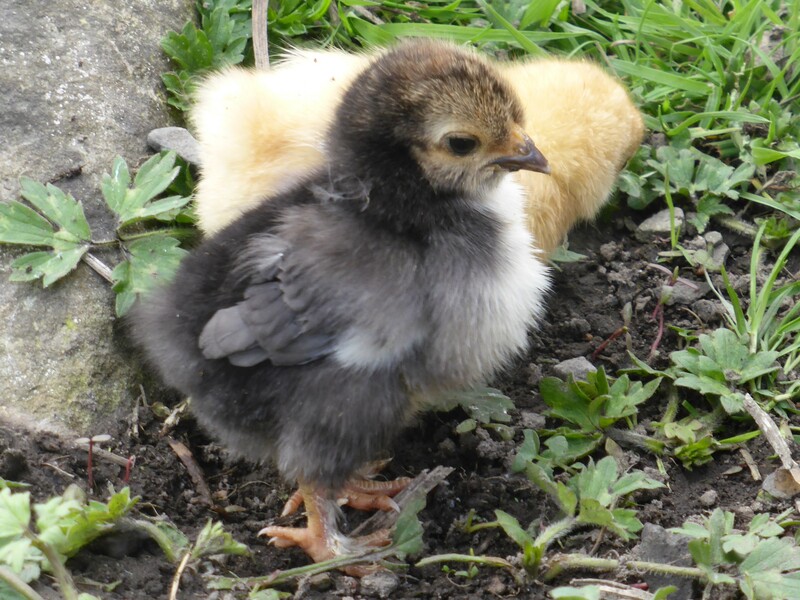 This entry was posted in Outside and tagged birds, chicks, cute, eggs, garden, henkeeping, hens, pets, poultry, silkie, springtime. Bookmark the permalink. 2 Responses to Chicks Chicks Chicks!